On Wednesday, August 31, 2016, leadership of Moët Hennessy and the Financial Times met at Meridian International Center for a dinner discussion on current trade, economic, public diplomacy, and social development issues directly related to the U.S. and France. 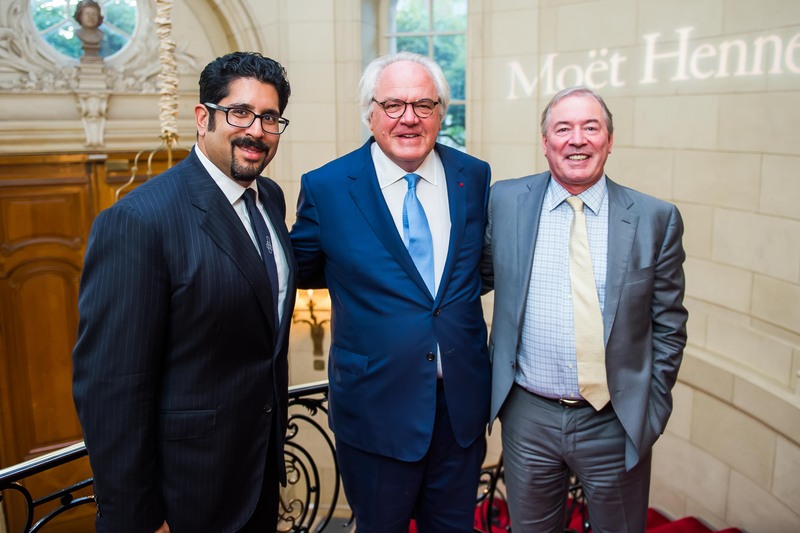 The event was hosted by Christophe Navarre, Chairman and CEO of Moët Hennessy and recipient of the 2014 Meridian Corporate Leader Award. 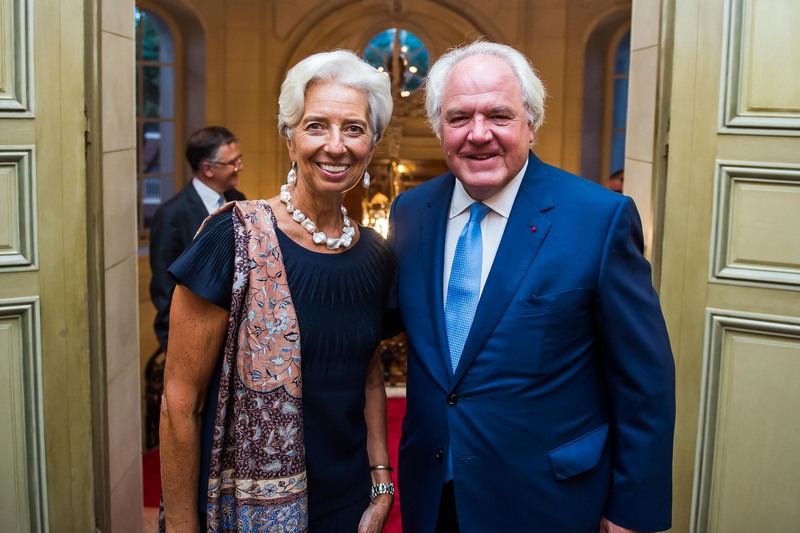 He and Ambassador Stuart Holliday, President and CEO, Meridian International Center, welcomed the evening’s prestigious guests with remarks on Franco-American friendship, on business and cultural ties. 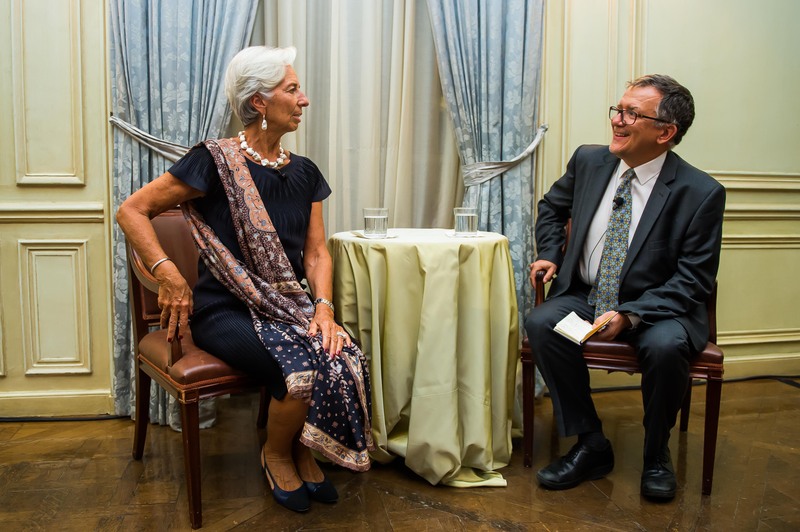 Following a delicious dinner paired with Moët Hennessy wines and spirits, Christine Lagarde, Managing Director of the International Monetary Fund, participated in a fascinating exchange moderated by Senior Investment Commentator of the Financial Times, John Authers. The event was attended by several top leaders from the government, business, diplomatic, and international development communities, including Deputy Secretary of Commerce, Bruce H. Andrews; Chairman, White House Council of Economic Advisors, Jason Furman; Chairman and CEO, LVMH Inc., Anish Melwani; President and CEO of Moët Hennessy North America, Jim Clerkin; Personal Aide to the President of the United States, Ferial Govashiri; World Trade Editor, Financial Times, Shawn Donnan; Global Luxury Director, Financial Times, Nessi Erkmenoglu; Chair, Albright Stonebridge Group and Chair, Meridian’s Board of Trustees, as well as Recipient of the 2012 Meridian Corporate Leader Award, Secretary Carlos Gutierrez; Former U.S. 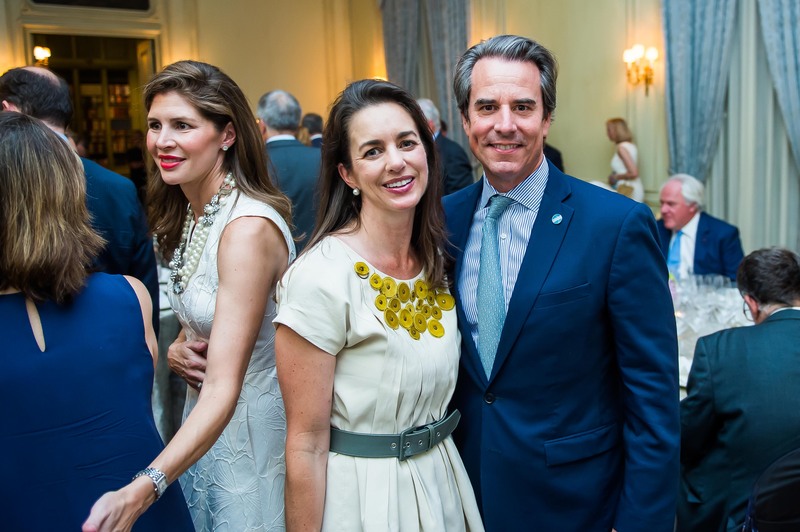 Ambassador to the Czech Republic and to France and Monaco and Recipient of the 2012 Meridian Global Citizen Award, Ambassador Craig R. Stapleton; Deputy Chief of Mission, Embassy of France, Nathalie Broadhurst; Chairman, French-American Foundation, Allan Chapin; U.S. Diplomatic Correspondent, Financial Times, Geoff Dyer; and U.S. Economics Editor, Financial Times, Sam Fleming. 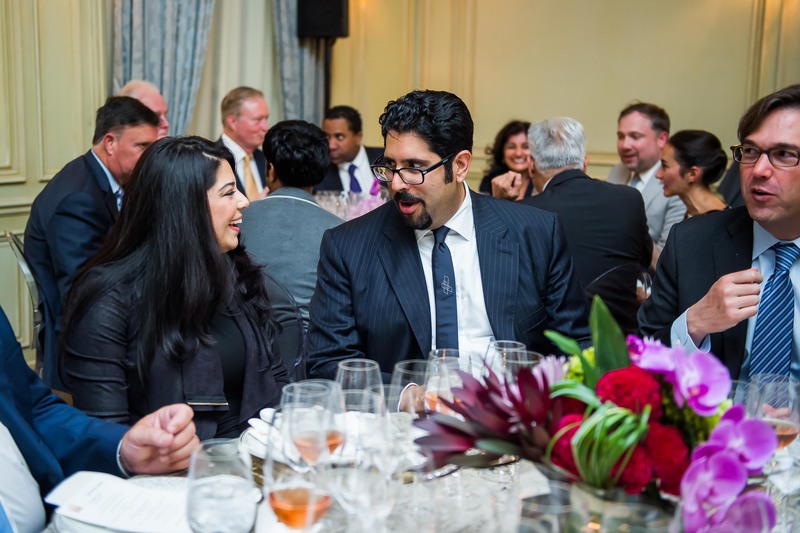 During their networking, dialogue, and dinner, guests enjoyed Dom Pérignon 2006, Moët & Chandon Grand Vintage Rosé 2006, Cheval des Andes 2011, Newton Unfiltered Chardonnay 2013, Veuve Clicquot Demi-Sec, Hennessy X.O, and Glenmorangie Signet. 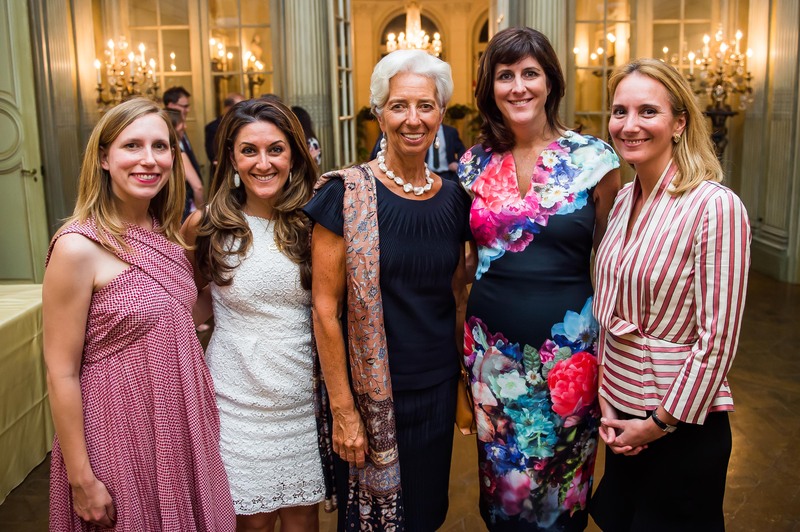 Meridian’s U.S.-France Leadership Dialogue convenes leaders from the public, private, and diplomatic sectors in both countries around timely issues central to the bilateral relationship. Meridian, dialogue partners, and participants identify key areas for collaboration on current economic, strategic, and social issues, and lay the groundwork for concrete initiatives to address such challenges. 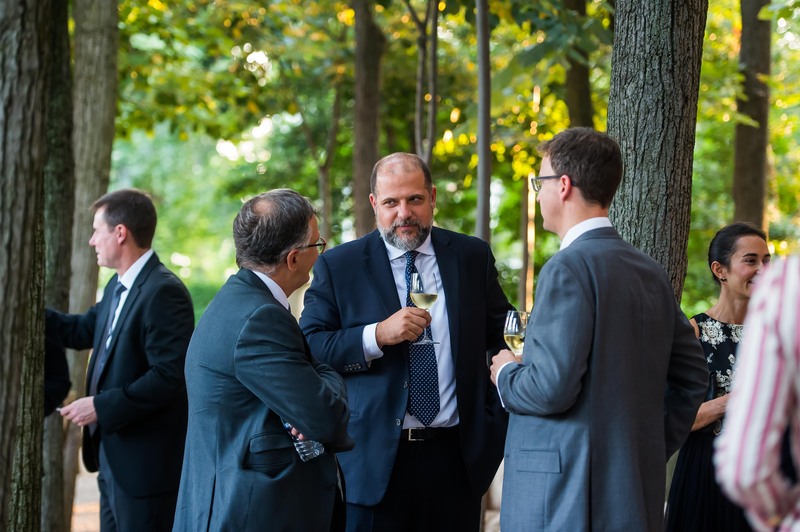 Comprised of public and private fora, salon dinners, roundtables, and international exchanges, the U.S. – France Leadership Dialogue is designed to create a sustained conversation among decision-makers and thought-leaders invested in Franco-American cooperation. Meridian’s partners in the Dialogue include Fortune500 companies and leading NGOs. Additionally, we work closely with the diplomatic community, including the French Embassy in Washington and the U.S. Embassy in Paris. Hennessy, Moët & Chandon, Veuve Clicquot, Dom Pérignon, Ruinart, Krug, Mercier, Belvedere, Glenmorangie, Ardbeg, Chandon, Newton, Cheval des Andes, Terrazas de los Andes, Cloudy Bay, Cape Mentelle, Numanthia, Ao Yun, Wenjun, Château Cheval Blanc, Château d'Yquem and Clos des Lambrays. The Financial Times is one of the world’s leading business news organizations, recognized internationally for its authority, integrity and accuracy. 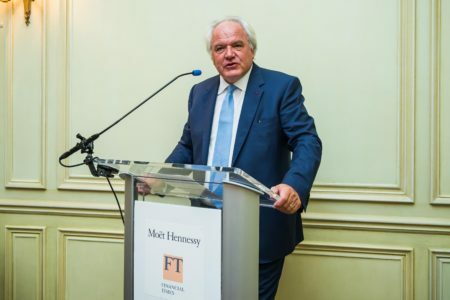 Providing essential news, comment, data and analysis for the global business community, the FT has a combined paid print and digital circulation in excess of 800,000. Mobile is an increasingly important channel for the FT, driving more than half of total traffic. Headquartered in Washington, D.C., Meridian International Center is a premier global leadership organization that prepares U.S. and international leaders to meet global challenges and opportunities. Meridian works with U.S. Department of State, partners in the government, private, NGO, and educational sectors globally, to create lasting international partnerships through leadership programs and cultural exchanges. Meridian also connects U.S. and foreign governments with the private sector to respond to global challenges and sustain impact.